Become the rockstar you have always known you are. 3 months. 3 opportunities to take the stage on your road to the top. 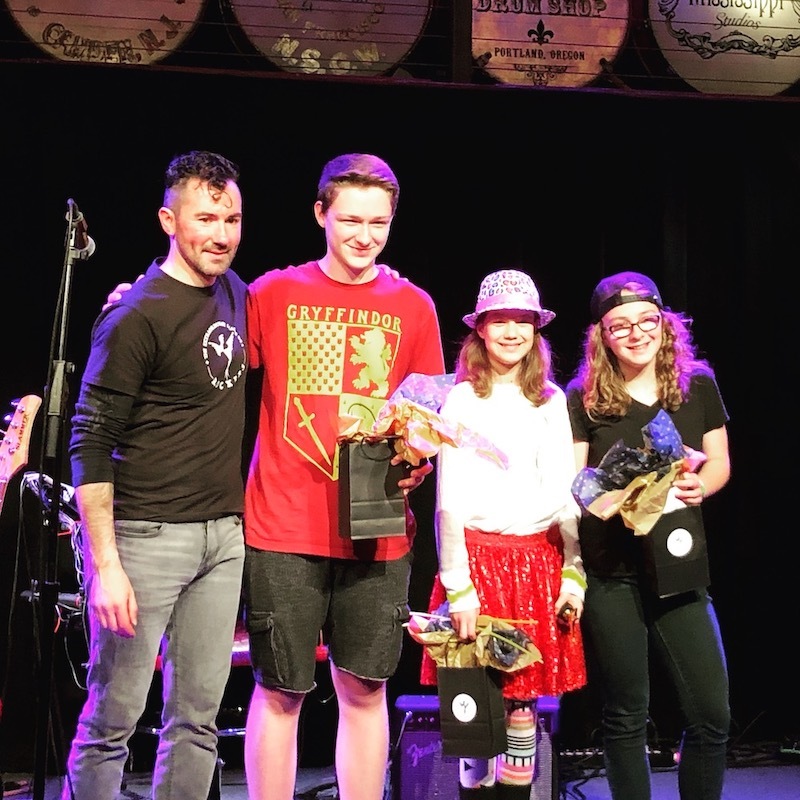 The eXtraordinary League of Rockers (XLR) is a unique music experience that takes future rockstars, aged 8 - 18 with a basic knowledge of their instrument, from jamming alone in their bedroom to rocking out in a band onstage. In real venues. Playing the music they want to play. The 3 performances per season are divided into "The Show-up", "The Show-off", and "The Showdown". The last performance brings a chance for the bands to wow the judges and win the Battle of the Bands, along with the enviable prize package. Along the way our rockers gain real-world experience in building a successful team, develop lasting friendships, and strengthen community. The myriad of skills they will acquire will help them land that world tour they've been eyeing or achieve any other dream they aspire to (not to mention having the adrenaline rush of their young lives)! Listen to our rockers in action by clicking on the tracks below to check out recordings from past XLR seasons. Sign up today to start your own journey to the stage! Join forces with other band members on your journey to the Battle of the Bands. Sign-up with your friends, or let us build a band with other students close to your age and skill level. You and your team help to choose the songs you want to perform along with your band’s coach. Your coach will put their years of touring, musical wisdom, and audience-energizing performance experience right into your hands (“paying your dues” just got a little less painful). Your coach will meet with you over the course of 3 months to rehearse once a week for 90 minutes. In these sessions you’ll build confidence to rock the judges and crowd, as well as increase your skill in the fundamentals of playing with other musicians. You'll learn things like song choice, memorizing arrangements, learning your individual part, showmanship and more. Are you a mellow crooner? Do you march to the beat of a different drummer? Does your passion soothe the aching soul or melt the eyebrows off the people in the first two rows? Explore sonic expressions, build confidence, and achieve skills that only the legendary wield with great renown. You may be surprised to find where those skills take you. XLR Season 4 Champions: The Band Diego! We pack out the house with friends, family and fans to create a one-of-a-kind experience for our bands. Everyone leaves feeling like a rockstar, but only one band takes home the title! Any young musician 11-18 years old with a basic knowledge of their instrument is encouraged to sign up (although we’d love you to be a CSM student too!). Your skill level and preferred instrument are the basic criteria used for band placement, but we'll certainly try to honor any request to team up with your fellow rockers! Just be sure to let us know who you would like to be in a band with when registering. Like a spark that lights a rocket to the stars, this one-hour demo will give you an overview of the XLR experience and fan the flame of your rockstar dreams. Be prepared to jam out with a band backtrack or band and catch a glimpse of the XLR Season 4 Tour, coming this September. Will you be one of the contenders for the XLR Season 5 crown? Sign up now for this great, FREE class! XLR: Ignite Session 1 - Coming Soon! XLR: Ignite Session 2 - Coming Soon! XLR Fire Starters is the same XLR training for our younger and newer Rockers who are looking to get a lot of experience in a band before heading to the big stage (think of it as a minor league program for XLR, preparing these young rockers for the big leagues). They will learn to mesh and meld together as a band before performing as openers for the final XLR performance of the season, The SHOWDOWN, at a live venue. Any young musician 8-12 years old with a basic knowledge of their instrument is encouraged to sign up (although we’d love you to be a CSM student too!). J Ring wanted to be a comic book artist when he was younger. It was his deep bond to storytelling through images that helped him connect to the world around him. "I was an extremely shy kid and it took a great deal of effort just to look in someone's direction, much less talk to them. Drawing was a natural way of understanding my world by testing and exploring relationships through my own adventures and stories, even if they lacked the necessary experience to make them believable [laughs]." Even though he felt at home expressing through images, he always had melodies and songs swimming around in his head. When he was 9 years old, the opportunity to pick up saxophone came and he quickly excelled at it, playing songs and writing music with it by ear while quietly maintaining his dream of becoming a comic book artist. He would tell you that was the day his 'comic book career' ended. "I found out very quickly that I could express things with the guitar that my pencil just wasn't equipped to and an entirely different world opened up to me that day." During his high school years he attended Douglas Anderson School of the Arts in Jacksonville, FL, where he studied many styles of music, from rock, blues, and jazz to flamenco and classical. He performed in numerous musicals, to helped to form a gigging jazz combo, and even took dancing and singing classes. He still regards those years as some of the most formative times of his life, "It was a foundry of creativity. So many artistic disciplines overlapped and so many talented people collaborated in a mutual effort to excel in one's craft and make something beautiful." His studies there culminated in writing and performing his own scholarship-winning senior recital piece for solo classical guitar and composing the 1st movement of a symphony at age 18. After high school, J studied guitar and composition under world-class teachers at Berklee College of Music in Boston, MA, where he further honed his writing and playing skills, with a focus on jazz and rock performance and film music studies. J has since written, arranged, and performed numerous pieces for solo guitar and orchestra, toured in a regional country/rock band, built his own guitar, and invented his own hybrid custom guitar strings. After over 15 years music teaching experience with both private lessons and classes, he was elated to have the opportunity to pioneer several music instruction methods to help Autistic and developmentally challenged students during his teaching tenure at Mason Music in Birmingham, AL, "The ineffable joy that is written all over someone when they've finally found a way of expressing something previously unreachable, of connecting to the world around them, of connecting to other people... It's priceless." He currently lives in Wilsonville, OR with his wife and three sons.